Minnesota Vikings Chat: Vikings cornerback Antoine Winfield is returning from a neck injury that kept him out several games; starting corner Chris Cook will not play Monday because of legal problems; and starting corner Cedric Griffin has struggled all season while trying to return from a second ACL injury. Unfortunately for the Vikings, the Packers have many talented receivers. Talk a little about their strengths and weaknesses, what dangers they pose to the Vikings secondary and how they can best be defended. Acme Packing Company: Any team wanting to stop Aaron Rodgers should figure out how to stop Greg Jennings. He’s been a factor in every game this season, and it could be disruptive if Rodgers’s number one target is taken away from him. Jordy Nelson and Jermichael Finley have been very good this season, but they can disappear from time-to-time if the offense is shifted away from them. But there is too much depth to stop everyone. Even James Jones has four touchdown receptions this season. 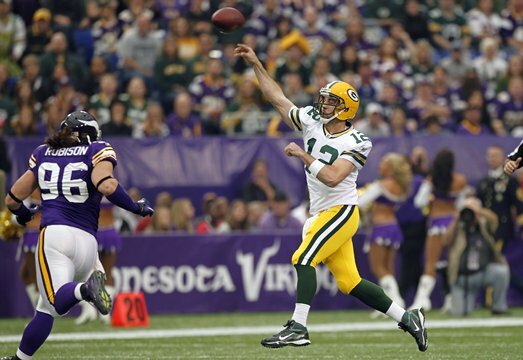 Minnesota Vikings Chat: Aaron Rogers is on fire this season. Aside from keeping him off the field, what’s the best way to slow him down? Acme Packing Company: I haven’t seen anything stop Rodgers this season. When teams pressure him, he runs and breaks down their coverage. When they drop into coverage, he’s got too much time to throw and usually finds someone. The Packers have a lot of other weaknesses, such as their pass defense and a backup left tackle. Opponents need to focus on beating the rest of the team. Minnesota Vikings Chat: Packers fans got a chance to see Vikings rookie quarterback Christian Ponder for a full game during our last matchup at Mall of America Field. What are your impressions? Acme Packing Company: Ponder was better than I expected. He’s a good athlete who can deliver a nice pass. His completion percentage is way too low (51.9%) but it’s only been three games. He does seem to stare down his primary receiver, and he’s a little too quick to run out of the pocket, but those are things he can improve on with experience. Minnesota Vikings Chat: The Vikings offensive game plan for this game should be fairly obvious: A lot of Adrian Peterson mixed in with some play-action passes. While Green Bay’s defense is 31st in the league against the pass, they are a far better eighth in the league against the run. How do you think Peterson will fare against the Packers? Acme Packing Company: Peterson should be great, and the Packer defense should focus on keeping the ball out of his hands. When the Packers beat the Vikings 31-3 last season in Minnesota, Favre threw it 38 times and Peterson only had 14 carries. That’s the type of ratio I’d like to see again. Minnesota Vikings Chat: You can’t walk down a street in Minnesota without tripping over five or six Packers fans; how much Purple do you see in those parts? Acme Packing Company: I’m from Madison, so in southern Wisconsin I run into a lot more Bears fans than Vikings fans. The only time I saw Vikings fans on a consistent basis was during college when a lot of Minnesota students would come down to Madison for college. Happy Belated Birthday to rookie tight end Kyle Rudloph (22)!